Like an insect im a nocturnal being, totally useless during the day.......but once the sun goes down thats when i get the most productive. Since i got that focusing rail (see previous post) i want to shoot all things macro. What is it about new gear that makes you want to shoot photos of everything that comes your way? Anyways, i went out tonight, was out for hours and came back with one picture. No thats not a typo.......just one photo, everything that i tried to shoot was just moving all over the place its like these insects were given caffeine or or crack or something. The worst is when i got it all set up so i could shoot, and just as im about to trip the shutter the bug decides it wants to go for a stroll. Well thats what my night consisted of, it wasn't a total loss though. 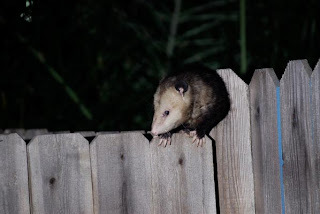 I scoped out were this HUGE black widow is living, so ill be stalking that area now, plus while i was out shooting this possum comes out of nowhere and is traveling along the fence next to my house. 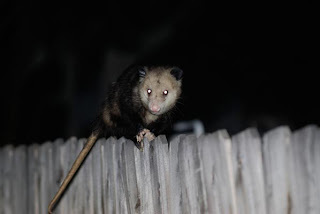 I hate possums, they have to be the ugliest creatures on the face of the planet. 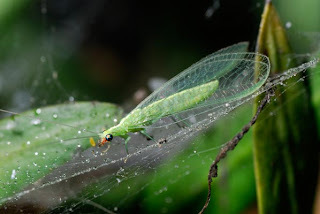 I can find beauty in almost anything, even bugs, but i cant seem to find any redeeming quality in these things. You ever wonder if GOD just ran out of ideas? I mean dont get me wrong, i have nothing but respect and admiration for the almighty creator.........but come on you would think that he would make the possum somewhat more appealing. When i die i have a list of creatures that i have questions on.....among them are the mosquito, the kangaroo, the possum and the duck billed platypus and many more. Im tires and im writing to much, heres some pics from tonight. Enjoy.